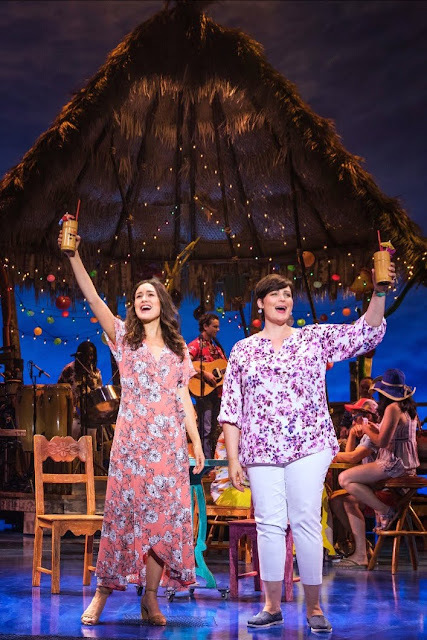 Carol's Theatre Reviews ~ It's Fun To Go Out: “Escape To Margaritaville The Musical” in world premiere at La Jolla Playhouse. 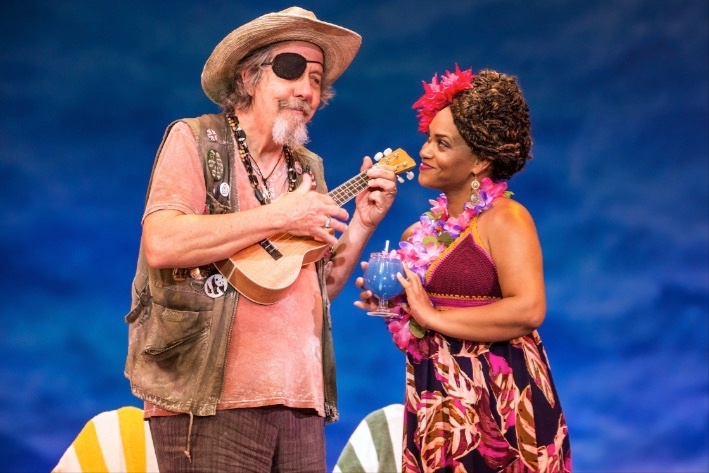 “Escape To Margaritaville The Musical” in world premiere at La Jolla Playhouse. “Some people say that there’s a woman to blame, but I know it’s my own damn fault.” That’s about it folks. Yup, that’s the extent of the words to the Jimmy Buffett hit “Margaritaville” that I can proudly say are still in my memory bank. 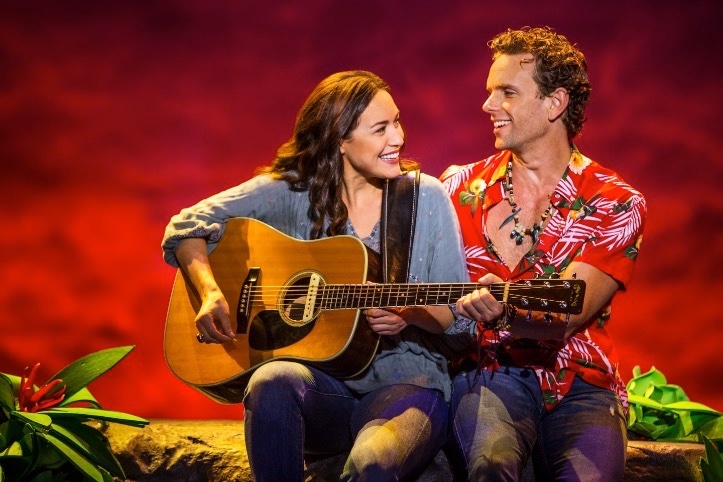 “Escape to Margaritaville” The Musical now in a pretty splashy world premiere production at the La Jolla Playhouse through (as of now) July 9th captures the essence of Buffett’s hit song. I must get with the program because the more than 20 odd musical numbers, while not that popular (to me) still resonated to the vast majority of theatre goers in the audience as the music rang out and the play played on. I took my niece, who claims not to be a Parrothead, (Buffett’s ardent and committed fans), just a fan but I could hear her singing along with others in the audience on opening night the tunes he’s most noted for. For this show he wrote a few new ones to be in sync with the moveable parts of the story line. Buffett, according to all I’ve seen and read, has been hanging around La Jolla and the beach areas lately and relishing all the attention heaped upon him by way of interviews and just being seen. He’s quite his own P.R. person even showing up at the end of his musical to join the youthful and enthusiastic cast, and to the delight of the opening night gathering, in the singing of (you guessed it) “Margaritaville”. The story with book by Greg Garcia and Mike O’Malley, music and lyrics Jimmy Buffett and choreographed by Kelly Devine are all in good hands with director Christopher Ashley. One has to admit that Ashley has a great batting average with new plays; consider “Come From Away” and “Indecent”. Truth be told, the story/plot in “Margaritaville, The Musical” boils down to your typical boy meets girl or boys meet girls on vacation somewhere on an island where drinks flow from morning to night and romances last from hotel sign in to rolling suitcases leaving the island for the next group of weekender’s. The island regulars keep the guests and themselves busy with the standard drink sharing, temporary company sharing and plenty of familiar repartee among them giving the impression they have been and will be permanent fixtures there, wherever ‘there’ is. There’s not much trouble in “Margaritaville” except ‘stuff’ gets in the way between one of the two couples, Tully and Rachel (Paul Alexander Nolan and Alison Luff). Both look great together, sing well together, but Nolan has the chops, the charm, accent, most of the tunes and the charisma to pull a Jimmy Buffet supposed to be. Luff is no slouch either. Her voice is in perfect shape and she can match him notr for note. Theirs is an on again off again relationship and you don’t have to be Perry Mason or Colombo to figure the ending. Rachel and Tammy (Lisa Howard) are there on a bachelorette get a way weekend from Tammy’s bully and misogynistic boyfriend Chadd (Alex Michael Stoll). Rachel is a sort of chaperone but finds herself almost involved with Tully from the start, except she’s too busy trying to promote her own business. Speaking of busy, there is a lot of busy stuff going on on this escape island. There’s a volcano about to erupt, a pilot J.D. (a wonderful old Old Globe blast from the past Don Sparks whose deep base voice is marvelously infectious) whose drinking habits have him grounded by another regular islander from another island, Marley (an outstanding Rema Webb). They play a cat and mouse game about a saltshaker that gets a bit worn after a while as does the calling of another fellow traveler and regular islander Jesus (Justin Mortelliti) as he insists his name is pronounced ‘Hay soos’. It’s mostly fun and games, if you don’t count the shtick about Tammy and her weight problem. They are brought to the fore by her lazy SOB fiancé who insists she go on a starvation diet of carrot juice and sunflower seeds so she can look svelte in her wedding dress, which by the way he had taken in after she had a fitting. Don’t make my blood boil. Her pairing up with Brick (a fun Charlie Pollock) the island’s bartender is the best thing that happened to her on this get-a-way. Suffice it to say the Buffet ballads hold their own: “Why Don’t We Get Drunk”, ”Volcano”, “”Grapefruit- Juicy Fruit”, “My Head Hurts, My Feet Stink and I Don’t Love Jesus”, “Why Don’t We Get Drunk?” “Son of a Son of a Sailor”, Cheeseburger Paradise” and “He Went To Paris”. You get the picture. It’s the look of the production that draws attention more than the story. Walt Spangler’s island set is surrounded by blue skies, Tiki Huts, grass topped trees, a café playing area where the barbs fly and the drinks flow. Paul Alexander Nolan (on chair) and cast. In the background a raised stage for the band/orchestra under the baton of Christopher Jahnke to keep us entertained with… the Buffett cache. At the volcano there are about eight grey suited from the dead insurance salesmen zombies that tap, soft shoe and simply show off their moves (Kelly Devine). They, as legend has it, got caught in the last volcano eruption. I must say I love the tap dancing. 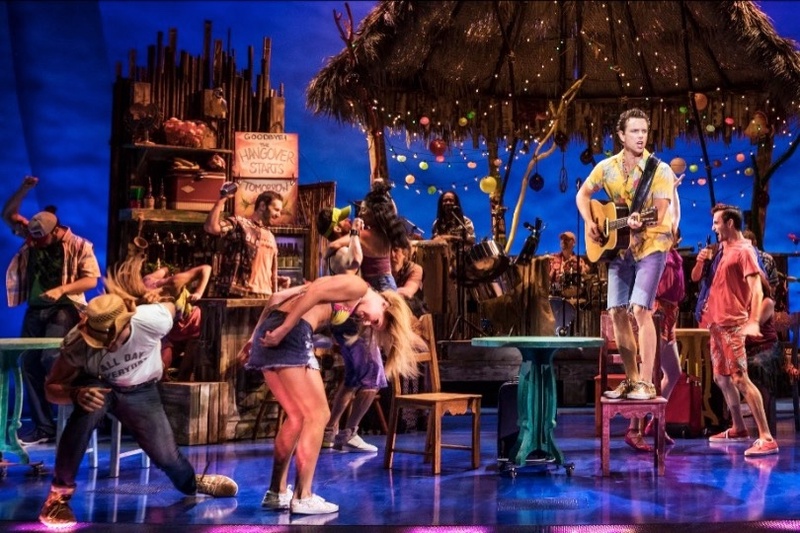 Paul Tazewell’s costumes are custom -made island wear that never ends, Howard Binkley’s lighting makes everything look good and Brian Ronan’s sound, well… it’s Buffett. In case you gave your island ware T shirts or silk shirts away or need something to identify you as a true Parrothead, there should be a grass covered booth where someone will be glad to oblige you with either one or all of the souvenirs on hand.